BBI Manufactures Five Brands of Fertilizer and Lime Spreaders so we are sure to have a Fertilizer and Lime Spreader that is Right for You!! 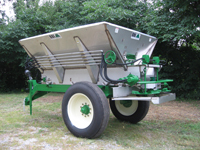 The BBI Fertilizer and Lime Spreader Brands include: MagnaSpread2, MagnaSpread3, MagnaSpread Ultra, Cricket Ag and Turf, and Liberty Mechanical Spreaders. 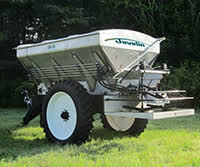 BBI Fertilizer and Lime Spreaders are available with 304 Stainless Steel, 409 Stainless Steel or Carbon Steel Hoppers. A BBI Fertilizer and Lime Spreader can be configured with Self Contained Hydraulics, Plug to Tractor Hydraulics or Mechanical Drive. All BBI Hydraulic Fertilizer Lime Spreaders in the MagnaSpread line are equipped with the BBI Binary Manifold and are READY to Plug N Play with all Agricultural Electronics. 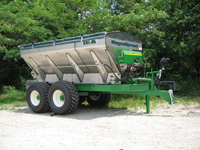 MagnaSpread 12� Single Axle Fertilizer Lime Spreader for Distribution of Granular Fertilizer or Lime � Medium Capacity � High Clearance - No Electronics, S6 CV PTO, Painted Carbon Ladder, 30" B.O.B, Class 3 Cast Hitch, SS Spinners and Fins, MagnaSpread Spinner System, GR Valve, High Torque Manifold, High duty Cycle Hydraulics with Oil Cooler, and 90-120" Wide Adjustable Track are standard and included in list price. 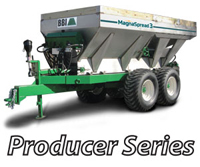 MagnaSpread -- Powered by Salford BBI's proprietary Continuous Duty Hydraulics, MagnaSpread is the biggest, strongest, and most efficient spreader for large-acreage applications. Featuring Salford BBI Binary� Manifold, MagnaSpread is precision agriculture-ready, with advanced technology for the most sophisticated farmers. If you have a large, high-tech operation, and you�re ready to leverage precision agriculture to the fullest, look to MagnaSpread. 20 Ton Walking Beam Suspension, 800/65R32 tires, Stainless Steel Spinners, High Duty Cycle Hydraulics with Oil Cooler, and Light Kit are standard and included in list price. With BBI's patented multi-bin technology, the MagnaSpread2 Pull-Type features two hoppers guided by independent variable-rate technology. 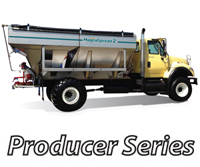 MagnaSpread2 gets dry application of fertilizer and lime done faster and more efficiently. High Duty Cycle Hydraulics with Oil Cooler Standard and included in base price. With BBI's patented multi-bin technology, the MagnaSpread2 Truck-Mount features two hoppers guided by independent variable-rate technology. 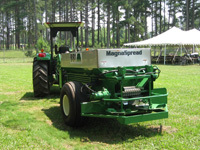 MagnaSpread2 gets dry application of fertilizer and lime done faster and more efficiently. 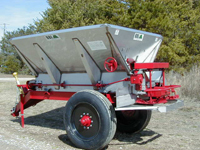 BBI Fertilizer and Lime Spreaders are available in Truck Mount or Pull Type Models. 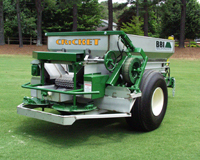 The BBI Spinner system produces a Spread Pattern for Fertilizer that is wide, flat and consistent. 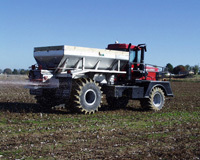 Check out our Cost in Use Calculator to see how much you can save with a BBI Fertilizer and Lime Spreader if you gain and extra 10 to 20 feet of spread swath per pass. 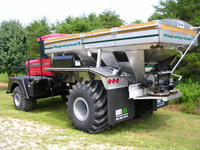 For more information on BBI Fertilizer and Lime Spreaders, contact BBI at 1-800-282-3570. BBI is headquartered in Cornelia, GA and distributes throughout the United States, Canada, South America, Europe and Asia.